People have been asking us for “Messenger-on-website” functionality for a while. Today, we’re proud to say that we are supporting the Customer Chat plugin in our dashboard the moment Facebook officially announces this feature. This means that our users can take advantage of this function out-of-the-box! So… What is Customer Chat? Customer Chat is a plugin that allows your website visitors to interact with your business through Facebook Messenger directly on your homepage. If you’re logged in to Facebook right now you should see the Customer Chat plugin in the bottom right corner of this article — go ahead and try it out! Now, let’s explore some ways you can benefit from this new feature! So you’ve built an email list, sometimes without subscriber’s names (who wants to fill out forms with multiple fields, right?). This leaves you with people like kitty1973@yahoo.com on the list. Awesome — what can you do with that? Typically, you would send all subscribers the same email follow-up because you really don’t know anything about each person individually. And how do people treat these impersonal emails? Correct — they don’t open them! (If you’re lucky, your email will pass at least some spam filters) So, how many engaged subscribers do we have remaining at this stage? Another tenfold drop would not be a far-fetched assumption. This leaves you with around 1.5% of all those initial visitors who are still paying attention. All that effort for only 1.5% engagement? Yikes! But hold on… Subscribers who only open and read your emails aren’t good enough! You want them to click your call-to-action! Of those who received your email, it’s safe to assume no more than 3% will click through. That’s less than 0.5% of your initial visitors at this point. Crazy! Email’s high acquisition costs and low conversion rates have forced businesses to bombard their audiences with more frequent and less personal messages. Unfortunately, this kind of behavior does not build meaningful relationships between businesses and their customers. We don’t like that, and neither does anyone else. 1. You don’t need to ask for an email on your website. If people want to engage with you, they can just press one button, and boom — you’ve established a conversation thread in Messenger. It will never expire (unlike cookies), so you can reach back to these people with an answer, an offer, a shipment tracking update, or even a simple post-purchase survey — right in the Messenger app on their phone. 2. Remember that kitty1973@yahoo.com thing? Once a visitor presses the Chat Now button on your Messenger bot, you immediately get their full name, language preference, profile photo, time zone, and gender from Facebook. Utilize your users’ details to engage them in a personalized manner right from the very first message. 3. It doesn’t stop there! When the conversation begins, you should start learning more about each user. Something important we’ve realized while building Chatfuel is that people LOVE answering questions in Messenger! 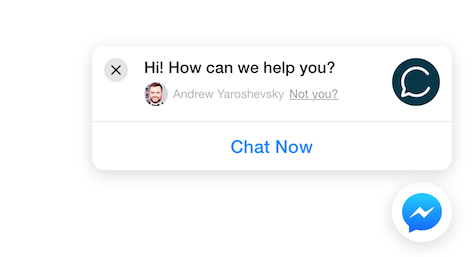 Design the conversational flow, add Quick Reply buttons (those blue, rounded buttons with suggested replies), and now you have the power to easily qualify each visitor into a specific segment by saving and storing their responses. Utilize buttons, images, videos, free-form text inputs, and much more using Chatfuel’s drag-n-drop editor. The best part? You don’t need any programming skills to build a user-friendly experience! 4. When a user has become a warm lead by progressing significantly down your bot’s funnel, you can hand over the conversation to a human for the ultimate personal touch. Chatfuel features an easy-to-use Live Chat plugin that can integrate with Salesforce, Zendesk, or any other CRM or customer service platform. Holy moly! Can you see this? You easily get 85% open rates and 35% CTRs in Messenger! People simply prefer Messenger as a communication channel over anything else. If they don’t call or email their friends, then why on earth would they want to do that with your business? When you prioritize user experience and personalization, these numbers can soar even higher. Combine this with the frictionless user acquisition of the Customer Chat plugin — instead of asking visitors to type in their email — and you get significantly reduced costs and nearly a 20x efficiency improvement on your marketing efforts. As a testament to the power of the Customer Chat plugin for digital marketers, one of our users — Jon Loomer — a well-known Facebook marketing expert, has already launched this experience on his website. Oh, and one more thing! You can embed the Customer Chat plugin for free — no limitations. Watch the video below, then visit chatfuel.com to make your digital marketing and communication more efficient, personalized and responsive. HelloFresh is a weekly subscription box service that delivers fresh, locally-sourced ingredients to your doorstep. Subscribers enjoy all the benefits of healthy, home-cooked meals without the hassle of meal planning and grocery shopping.